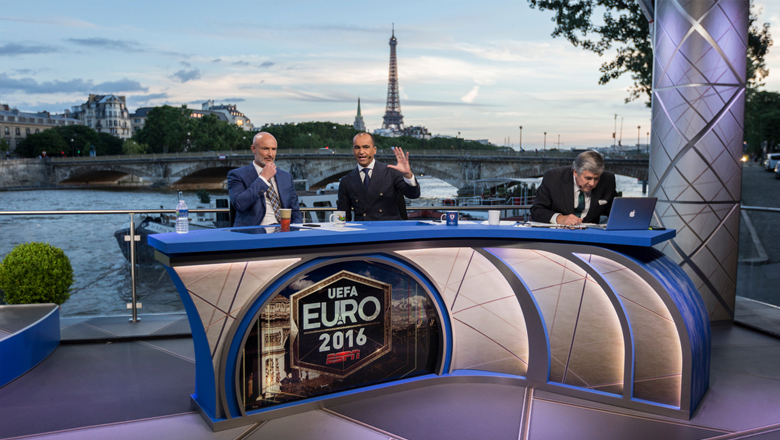 ESPN’s coverage of the UEFA Euro 2016 championships is back up and running at its riverside studio. 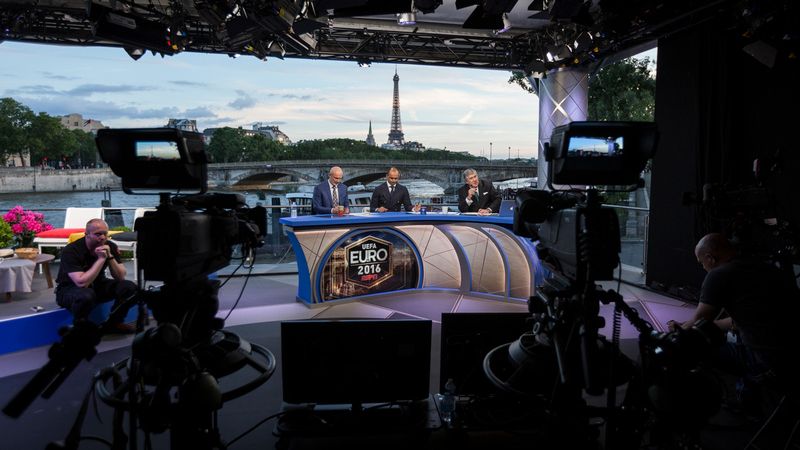 The setup, located along Port des Champs-Élysées, with view of Eiffel Tower in Paris, was temporarily closed due to severe flooding and protests in the city at the start of the tournament in early June. 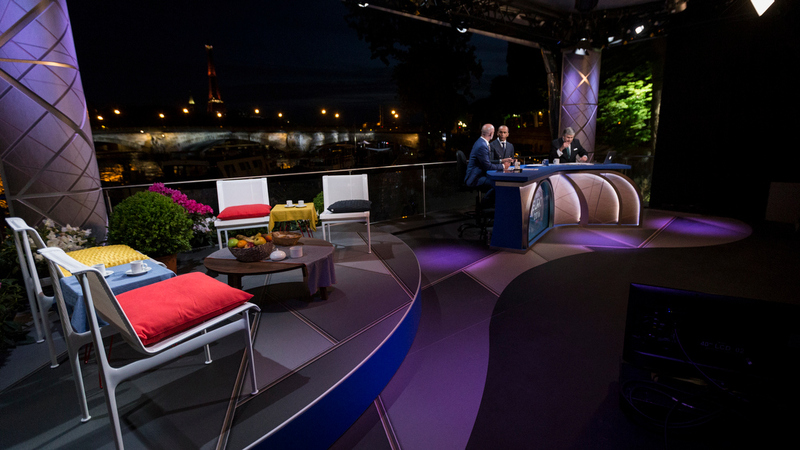 The temporary structure serves as home base for the cable network’s coverage of the European football (aka soccer in North America) tournament, which includes 24 teams competing at sites around France. 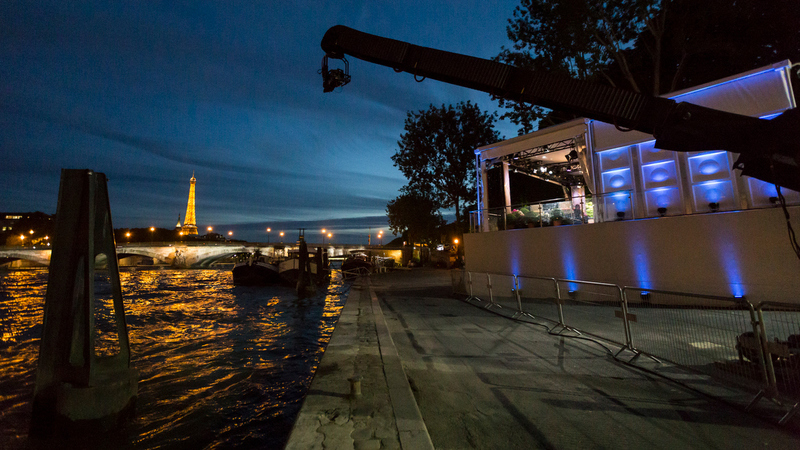 The set takes full advantage of the Seine River and Eiffel Tower, with that iconic cityscape dominating the look. 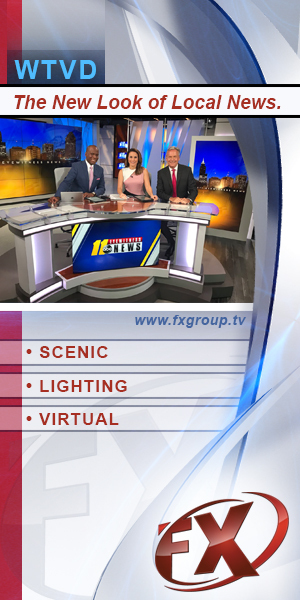 An anchor desk is fronted with curved and faceted semi-transparent panels, somewhat reminiscent of the architectural details found in the Eiffel Tower itself. The structure itself is supported by columns wrapped in a similar texture. That pattern also has some visual similarities to the UEFA logo as well as the polygonal pattern found on football (soccer) balls. The set, which was designed by Hotopp Associates, also includes an interview area with white chairs and colorful cushions arranged around a coffee table and accessorized with flowers. During the flooding, the network was able to find, at the last minute, an alternate location near another Paris landmark — the Arc de Triomphe. Some parts of the set were relocated there, but it was a stripped down version of the set found along the Seine.